I’m a babywearing Mama, my husband is a babywearing Daddy. We have been since our twins were born. It a few local stores we are known as the ‘babywearing family’! We love it and wouldn’t have it any other way. We started out wearing the twins in wraps. They were wonderful and comfortable. However, like babies tend to do, the twins got bigger, and bigger thus making our wraps no longer the most comfortable option. We knew that it was time to add something new! The twins LOVE to be carried on the front, they love to be close and hate riding in a stroller, so we knew we need to find the right carrier…and NOW! We tried everything, but nothing seemed to be right, everything we tried worked ok on the back, but the twins didn’t like being on the back all the time, so if we switched to the front it was just…not the right fit for us and our life style. My husband complained about back pain and so did I. We couldn’t help but think this was the ‘babywearing end’. Then much to our surprise and joy a wonderful ray of light enter our lives…it is called ERGObaby!! A Fantastic Green ERGObaby Organic Carrier to review! It is beautiful! “Using the ERGObaby carrier gives you continuous connection, fabulous feeling of freedom, and security knowing your baby is safe. This is the all-in-one soft baby carrier, assisting you through all the stages of your baby’s growth and moving from front to hip to back position easily. Parents tell us the ERGObaby carrier is the best of all the baby carriers on the market. It was designed by Karin Frost and has undergone extensive testing by tens of thousands of parents. Its innovative design makes wearing your baby comfortable for hours at a time, gives you the freedom to remain active and productive in your daily life, and holds your baby secure to your body so you are HandsFree. “Our Certified 100% Organic cotton is grown, processed and manufactured in compliance with Organic Fiber Processing Standards, utilizing natural agricultural methodology without the application of toxic chemicals. The emphasis is to avoid negative impact on surrounding eco-systems. Many minds and hands around the world contributed to the manufacture of the ERGObaby Organic product,… all in the spirit of preserving our planet and advancing fair labor practices. The benefit to the consumer, especially to our babies, is the softness and quality that only Organic cotton can provide. This is one of the top reasons people choose Organic cotton for their delicate baby’s skin. You are personally contributing to the shift in awareness for strong environmental responsibility by supporting the farmers, fabric mills, artisans, sewing factories and retailers of this Organic cotton product. ERGObaby is wonderful! Amazingly comfortable on the back and even more comfy on the front!! The padding is wonderful, the buckles are strong and sturdy! When I first saw all the buckles I thought to my self ‘ this isn’t going to be quick and easy to put on, when I have a screaming little one’ – Ok, I was TOTALLY and completely wrong. I can get it on and buckles by my self faster than ANY other carrier I have ever used! When front carring the back buckle is easy to reach and straps are very easy to loosen to tighten! Putting the baby in the back carring position is something I have always been nervous about doing on my own. With ERGObaby it is a breeze!! When out and about there is no shoulder or back fatigue because the straps are wide and very padded. The waste strap is comfy as well. No lower back pain! This is a very big deal to me personally. My lower back has become very easily fatigued since the twins were born, due to a half dozen spinal tap attempts. With the ERGObaby, I barely even notice that I have on the carrier. Most Importantly, the twins both LOVE it, they are able to snuggle up close to a pain free Mommy and Daddy! In my personal opinion this is the best carrier I have used! 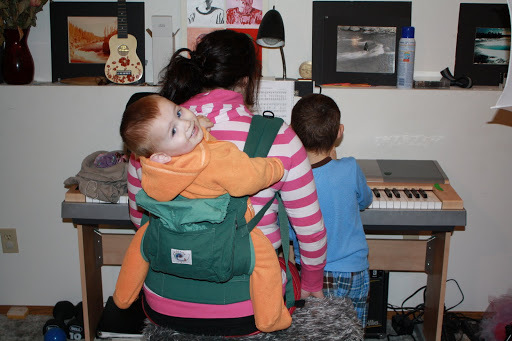 I would recommend ERGObaby to ANYONE searching for a carrier! I almost can’t believe that we have made it this far without a ERGO! *This review is 100% my personal opinion. I was not persuaded by ERGObaby to write any part of my review. 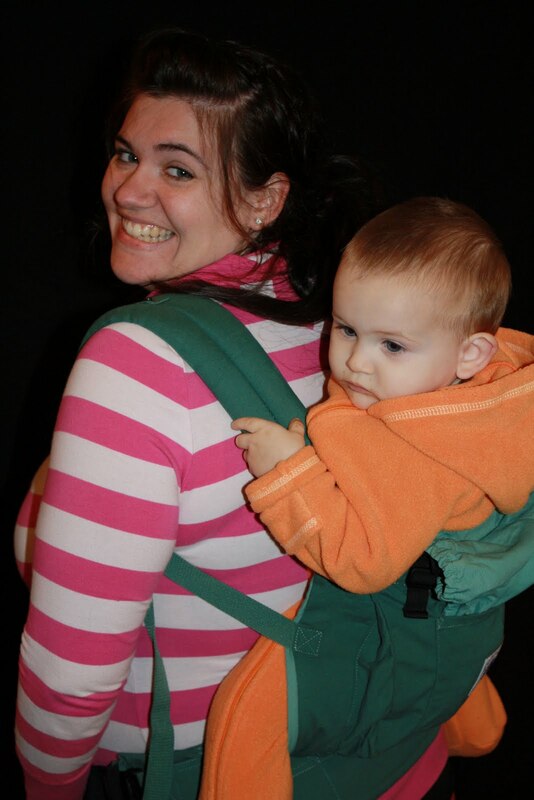 ERGObaby ONLY provided a Carrier for me to review, the article/review was written solely by me! This Giveaway is now Closed! I hope you enjoyed the Review! What is up for Grabs??? ERGObaby is giving away one of their awesome ERGObaby Carriers to one Lucky reader of A little Sugar n’ Spice! Awesome huh!! To be correctly entered in the ERGObaby Carrier Giveaway Both Following ALSNS and ‘liking’ ERGObaby on facebook MUST be completed. – Visit ERGObaby and tell me what you want to win!! – Like A Little Sugar-n-Spice on Facebook and share ALSNS & Giveaway with your FB friends! Make any shirt and nursing shirt and become a Undercover Mama like me! « My Awesome new Sponsor!! I Like ALSNS and ErgoBaby on facebook. I follow ERgoBaby on twitter. I sent you a request to follow you on twitter. I am. . . - Bloggy McBloggerstein!